"With the release of Deep Shadows, I hope to catapult the Christian reader into the world of dystopian fiction. It's a genre I love, and I'm excited to write such a story from a faith oriented point of view. Max, Shelby, and Carter find their world shattered when a solar flare destroys all technology, but as the shadows deepen across their landscape they learn the value of friendship, of family, and of a faith that can see us through the darkest of times. My prayer is that this first book in The Remnant series will share the truth that God's grace is sufficient, regardless our circumstances." "A cool thriller that looks at human behavior in the face of adversity, this one will have readers thinking." 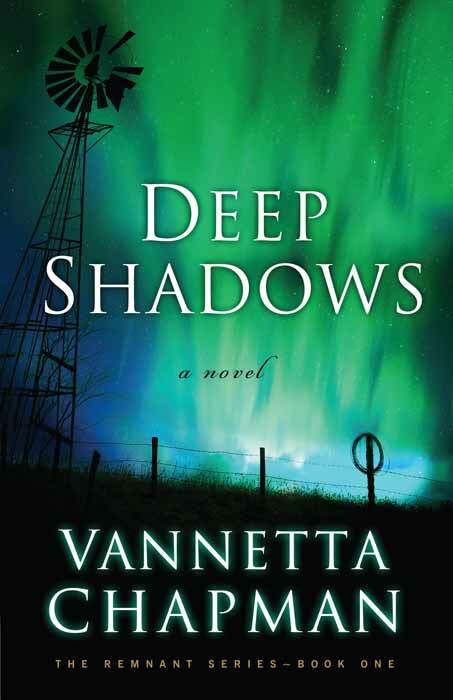 "[T]he story line was captivating, as author Vannetta Chapman takes us on a futuristic journey of solar flares, power outages, and a return to a past way of life..."
Deep Shadows is a book that is going to make you think. We get to witness what life will probably be like if such a catastrophe were to happen, martial law happens, and it seems no one is like they used to be. There are fires, and explosions, needless death, and everyday fights for survival, and should they stay in their town, or leave and go to where they might survive. This is a book you won’t be able to put down, and after the last page is turned, you won’t soon forget. I enjoyed this book, even though, it wasn’t just a fast page turner for me. In spite of that fact though, the story line was captivating, as author Vannetta Chapman takes us on a futuristic journey of solar flares, power outages, and a return to a past way of life. I enjoyed reading about the way the town pulled together to weather the tragedy. How they got creative with coping and coming up with ways to fill in the gaps. I enjoyed Vannetta’s take on faith and God’s sovereignty in all that happened. This book ends well, but also leaves a bit of a cliffhanger to encourage you to read number two in the series, which of course I am eagerly awaiting the release of when the time comes. Let me start by saying this was a very intriguing book. When I opened it I was immediately drawn into the story. The plot is something that I have long worried might happen, the collapse of not only technology, but our very way of life. I know most people believe that it’s an impossibility with all the backups, but let me ask you this what if it did happen? What if you were suddenly without the basic necessities for living? Scary when you really think of it. We are introduced to strong, engaging characters that after finishing the book I found myself still thinking about. The plot flows effortlessly and swallowed me heart and soul. I kept putting myself in the story line and thinking “what if.” I could go on and on about how much I loved this book, but I would only be repeating myself. The book has elements of mystery, spine tingling suspense, faith and a mild romance. I would recommend this book to anyone. Deep Shadows may very well be Ms. Chapman’s best achievement yet! This dystopian novel is staggering, so realistic that when I laid the book aside, I fully expected conditions from the book to be actual! I was forced to look at the world around me differently, and expected to discover my surroundings as they are described in this powerful novel. Deep Shadows changed the way I see the world, and the importance of modifications in our lifestyles for self preservation. I highly recommend Deep Shadows! This is no ordinary story. It is reality fiction at its best, and everyone from young adults to the elderly can relate to the possibilities this powerful novel represents. Impressive! I have so many thoughts about this book I’m having trouble deciding which one to express first. When I first heard about this book and realized that one of my fave authors had switched genres, I absolutely knew I had to get a copy. Chapman’s writing is just THAT good and Deep Shadows became one of my most anticipated reads of the year!! And of course, I love that cover! I was NOT disappointed and I even had the silly notion that I could read the first few chapters and go to bed when starting this book, DIDN’T happen….I was falling asleep but I read the first 40 pages before being able to put the book away. Chapman went to a whole new level in writing this book and it pulled me in from the start. I’ve read dystopian/apocalyptic books before, but the difference with Chapman is that she gives a realistic situation with hope and you REALLY get to love the characters whether you agree with them or not. This book definitely makes you think, but it’s not a sad story like I thought it would be. This was an intense story, but it was done with hope, faith, and realism. I was truly amazed by the details the author considers in creating this story. I’m a sensitive reader, but I highly recommend this book for those who enjoy dystopian stories. Chapman’s writing style is very unique and you won’t be disappointed! 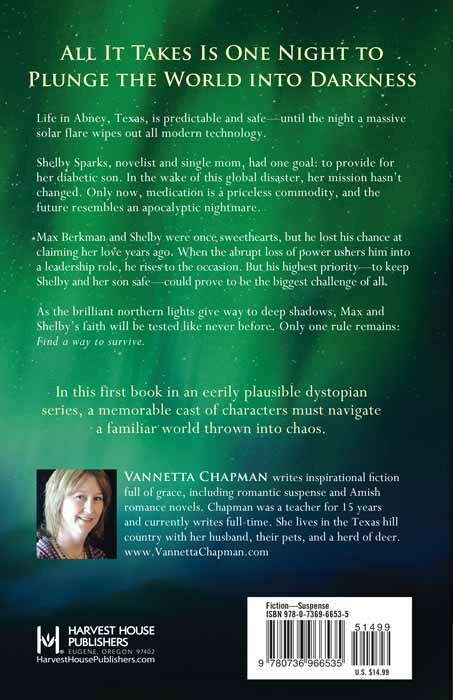 "Vannetta Chapman begins a new series (The Remnant) with her newest book, Deep Shadows. With the flash of a solar flare, life for residents of a small Texas town is changed, perhaps forever. Such a believable and possible situation to write about and the author does a wonderful job of making this story credible.... With edge-of-your-seat suspense this is an intense, provocative book, causing readers to wonder about their own reaction and preparedness for a disaster of this magnitude." "I write romance, but sometimes love reading books that are a little different. Deep Shadows definitely fits that description! As the subtitle promotes-The Remnant series, Book One-this book takes place after a catastrophic event that changes the world as we know it. A solar flare wipes out all modern technology and most of the power grid. This story is about how the people of Abney, Texas try to survive.... And it ends with a cliffhanger, so you know there will be a book 2 and hopefully more. I plan to read them, how about you? Write fast, Vannetta Chapman!" "Deep Shadows, the powerful dystopian suspense first book of 'The Remnant Series' may keep you up at night. First, you'll be awake finishing the book, then in mental agitation over when the solar flare chaos will begin in reality. Award winning Vannetta Chapman excels in yet another writing genre." "Deep Shadows by Vannetta Chapman is a book like no other that I've read. With suspense and intrigue, Ms. Chapman weaves together a tale that caused me to stop and rethink everyday life." "I'm so thrilled Chapman switched genres to write this story and even though there is sadness (towards the end, there was one tragedy that gripped my heart), there is also humor, faith, friendship and one small town in Texas who will stand together to make survival possible! I'm a sensitive reader, but I highly recommend this book for those who enjoy dystopian stories. Chapman's writing style is very unique and you won't be disappointed!" "I highly recommend this book to everyone. While I understand a deep topic such as a solar flare (which I learned are real - thank you Vannetta!) is not for everyone, I encourage you to try this with an open mind. Look at it as a book that shows how a community can try to come together during a crisis, or how a mother will do anything to save her son, or how a friendship is tested. You will not regret it!" "Chapman's book is a suspenseful heart-pounding read. But through it all, the message of God's grace is woven into the text. Vannetta Chapman's foray into a different genre-Christian dystopian fiction, is a very successful venture. Her in-depth research brings credibility as well as suspense to this novel. If you would like to read a book that keeps you hanging on the edge of your seat, this is a great read for you! I highly recommend Deep Shadows, it is a five star read!" "This is a story of survival and faith. Vannetta Chapman brings the story and the characters to life in such detail that I felt I was right there with the people in the story.... A wonderful book that I plan to read again." "If you enjoy a really good mystery that hinges on reality, you need to pick up Deep Shadows."